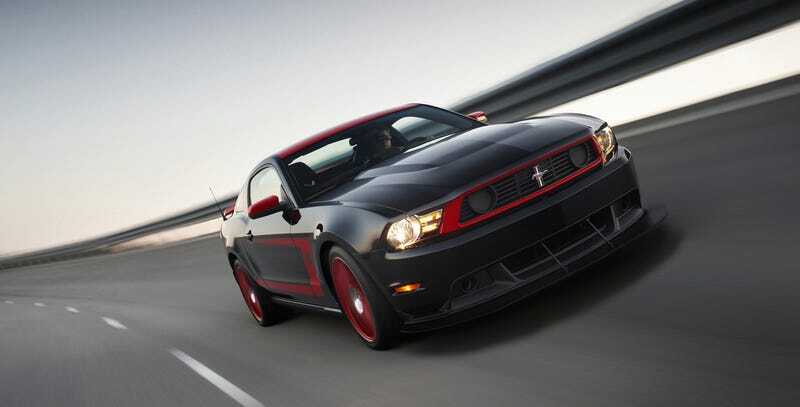 Ford's unveiled a fully-upgraded 2012 Mustang Boss 302 with a revised-intake 5.0-liter V8 delivering 440 horsepower and 380 lb-ft of torque, upgraded clutch, brakes, adjustable suspension, bitchin' side pipes and race-inspired interior. Very boss, indeed. The new Boss picks up where the original 1969 cars left off: high-rpm power and tenacious handling in a purpose-built road racer. Engineers started with the engine, moving to a runners-in-the-box velocity stack intake setup to improve high-rpm power, dropped in more aggressive cams, changed the tuning on the variable cam timing and then opened up the exhaust in an interesting way. The car features a quad exhaust layout with two traditional outlets going out the back and a set of side pipes that aren't just for show. On the road, most of the exhaust stream goes out the back, with the side pipes doing auditory duty for the most part. On the track however, where noise restrictions aren't so stiff, you can remove the attenuation discs and drop in a bypass spacer for full-on side pipe action. The system's even sized for aftermarket electronic bypass valves, you know, just in case you have an off-road application for it. Wink, wink. The end result is 440 hp and 380 lb-ft of torque, not a bad upgrade over the stock 5.0-liter's 412 hp, though that's 10 lb-ft less in the torque department. Remember, this car's designed to be wrung out on the track, not raced stoplight to stoplight. But it's not all engine, the car also gets an upgraded clutch and short throw shifter, retuned electronic steering, traction control and stability control. The suspension sees some nice attention, too, as there are stiffer springs all around, larger diameter anti-roll bars and Ford's installed manually adjustable dampers with five different stiffness settings. Grab a screwdriver and you can change the damping from each shock tower — cool! The rear end is geared at 3.73 with long-life carbon fiber plates slipped into the limited slip differential. There's also an optional Torsen torque-sensing limited-slip differential. Going and turning are great, but they need backup. Sorta like 14-inch four piston Brembo's all around behind lightweight 19" racing wheels wearing Pirelli PZero 9" rubber up front and 9.5" in the back. So now we've got engine, transmission, rear-end, software and suspension upgrades, what could be missing? Oh, right, the shiny bits. There's a distinct connection between this Boss' styling and the original. The front fascia has blocked off fog lamps and an aggressive chin spoiler. The cars will be available only in orange, white, blue, yellow or red and come with a white or black roof. Don't forget those side pipes either. Inside there's a suede-wrapped steering wheel, cue-ball shifter, dark-painted dash, optional Recaro buckets — they even stripped out 11 lbs of sound deadening to not only make it lighter, but louder. Should you want the hardest possible street legal Mustang, Ford will be offering a limited number of Mustang Boss 302 Laguna Seca editions to celebrate Parnelli Jones' victory there in 1970. Chuck all the creature comforts, add body stiffeners, the aero package from the Boss 302R and go racin'. We suspect Parnelli Jones will be waiting for his copy to show up any day now while the rest of us wait for them to announce a price.